Just when I thought that we had seen the end of the official Twilight movie merchandise, I got an email for a new Amazon Exclusive. 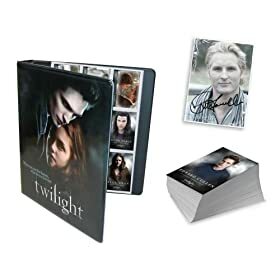 We have written about the Twilight Trading Cards in the past, but this is a new set 72 cards, a binder, and Peter Facinelli’s autograph. Only 5000 of them will be sold worldwide. Although there is not much of a description, it looks to me like the cards are the same ones that we have seen advertised in the past. Essentially, they are cards with pictures from the Twilight movie and include facts and information about the movie and the characters. The set is $39.99 and includes free shipping. They are pre-order only and will ship July 1. I’m not sure that many people will actually be “trading” these cards, but they would make a nice collector’s item for the diehard Twilight fan. The Exclusive Twilight Limited Edition Trading Card Set is available only at Amazon. omg i want that!!! lol first comment! I love edward so much I already have some of the trading cards and I have the collectible edward doll.